Just a quick little update for you this lovely Christmas Eve. 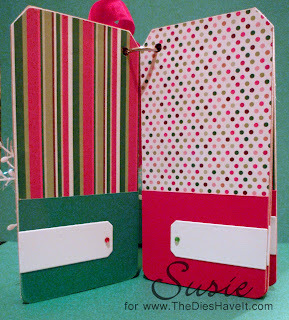 Here is the inside of that tag book I did for my friend Robin. The red and green sections at the bottom of each tag are actually pockets for the gift cards. The label is for her to write a quick note on each. Now go and have a wonderful Christmas Eve! And remember the reason for the season is Jesus.